Customer support is not only a way for businesses to resolve complaints. It is also a crucial aspect in improving business competitiveness and boosting sales opportunities. However, with the number of processes involved in providing customer service, this can be quite an overwhelming task. To simplify the process, you will need a help desk software. Beyond addressing customer queries, help desk solutions can help companies: maintain a positive relationship with customers; generate leads based on insights; or provide a tactical starting point to make the business more efficient in meeting market’s needs. However, with a slew of help desk solutions vying for your money, the landscape can be overwhelming for many companies. We’re here to help you choose the right software for your needs by describing what we think are the best help desk software solutions available on the market. Note that the software solutions on this list are specifically selected to be varied to give you a broad scope of options depending on your business size, industry, and focus. Some will cater to small businesses while others to large enterprises. Still, others are strong in one aspect, while others take a more generalist approach. Amidst these confusing scenarios, we also tried to suggest what seems to be the best universal option that simply offers the best value for money and can address most of the typical customer support requirements. Hopefully upon checking our list, you were able to find a solution that suits your needs. What are the 15 best help desk software systems for your business? Freshdesk tops our list of best help desk software systems primarily for its intuitive UI, extensive feature selection, powerful scalability, and great tech support. You’ll find many of these traits in other top help desk solutions, but, after reviewing all angles, Freshdesk has the most balanced benefits for both small business and large enterprise. With it, you can get access to the advanced solutions that full-fledged service desks have to offer without the complexity in navigation and controls. The software also offers affordable plans, making it great for companies of all sizes. Moreover, setting up the software is particularly easy so you don’t have to hire external tech support or pay for hefty installation fees. After running Freshdesk through a series of tests and problem scenarios, we were really impressed with the results. Currently, it’s a solution that simply offers the best value for your money. You can actually check for yourself if Freshdesk can improve your customer service by signing up for a comprehensive, no-commitment free trial they offer. You can easily sign up for Freshdesk free trial here. In our analysis of the software, we found many benefits of using Freshdesk, but the best one is perhaps the fact that it allows you to effectively stay on top of all customer queries. A single dashboard lets you sort, prioritize, and assign tickets, practically removing the risk of missing a ticket or two. You also get multi-channel support including phone, email, live chat, and a self-service portal, so your customers will actually feel that you’re paying attention to their concerns 24/7. Despite being easy to use, its ticketing features include enterprise-level functions such as smart automation and deep customization. For example, you can offload repetitive tasks or de-escalate complaints regardless of the workload volume. This is especially important to growing companies or businesses that rely on seasonal sales when hotline support needs to be expanded but only for the day. Another noticeable benefit of Freshdesk is its gamification features. Although several other help desk solutions also have this module, Freshdesk’s arcade-fun feature ups the excitement. It actually lets your customer reps become more motivated because it makes them feel like they are indeed playing for fun instead of trying to meet targets in boring coupon-like mechanics or tabulated forms. Freshdesk also integrates with other popular solutions and standard business apps, such as, Google Apps, Capsule CRM, and Harvest. It is very easy to set up and customize, too. Because of this, small companies without a tech team can easily follow an intuitive tutorial or get help from the vendor’s knowledge base or tech support if need be. On the other hand, tech teams from large enterprises will find the help desk solution flexible with an API integration and deep customization. Salesforce Essentials is Salesforce’s answer for the CRM and customer support needs of small businesses worldwide. What makes it stand out from other help desk solutions is that it not only provides users with robust ticketing systems and multi-channel help desk tools. The software also has comprehensive customer relationship management features that allow businesses to personalize the experience of each client that contacts them. Similar to Freshdesk and the other products on this list, Salesforce Essentials can consolidate inquiries from all of your communication channels and manage them in a single program. After which, these are queued and routed to to your agents automatically. To add to that, it also has a built-in database of customer information which includes contact details and previous interactions so agents can pick up conversations with ease. In case you feel like this platform still lacks some specific functions that you are looking for, don’t worry. 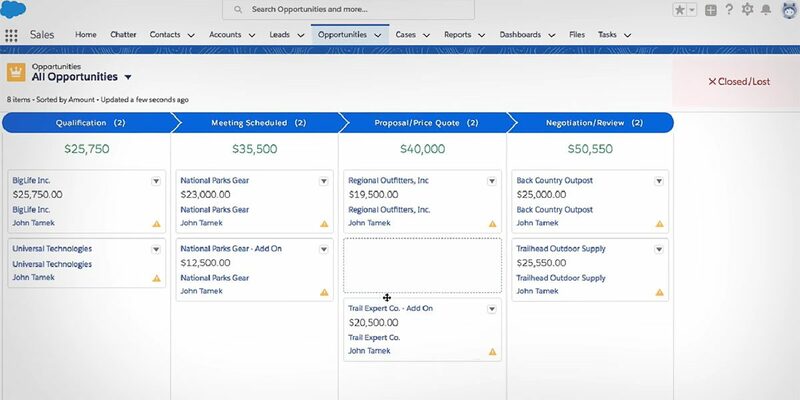 Salesforce Essentials has open API capabilities that let allow it to integrate with a multitude of third-party applications. This way, you can combine it with your existing systems or extend its functions using new ones. You may even build features, widgets, and add-ons from scratch using its Lightning App Builder tool. You can easily sign up for a Salesforce Essentials free trial here and get to know the features firsthand at no cost and without commitment. Zendesk is a fully-integrated customer support software designed to cater to the needs of all businesses sizes. Leveraging tools for help desk management, ticket management, multi-channel communication, and call center management, this cloud-hosted and mobile-ready tool can help you streamline your operations and optimize your workflow. What’s more is that it allows you to lessen agent workload and maximize your content through its knowledge base tool and AI-powered bot. Another great thing about Zendesk is that it is purpose-built to help you not only run your customer support operations but improve it too. It comes equipped with custom reporting tools that will help you get a deeper understanding of the whats, whys, and hows of your processes. In addition, Zendesk is one of the most scalable platforms on the market. For starters, it comes with pre-built integrations with Salesforce and SugarCRM for better customer service. If that’s not enough, the platform also has open API and REST API tools that will allow you to connect the platform to over 600 third-party applications. Should you want to get a better understanding of how this platform works, you can sign up for a Zendesk free trial here. Another product from a popular software provider, Zoho Desk is a one-stop customer support hub for businesses of all sizes. It serves as a ticketing system, call center software, and social support software and even provides users with reporting and analytics tools to keep tabs on operational productivity and performance. Moreover, the software supports knowledge bases, forums, and other forms of self-service support. With Zoho Desk, businesses can collect service requests and inquiries coming from different communication channels. After which, it will be fed to the ticketing system where they are sorted according to urgency, category, area, and other custom criteria before being forwarded to your agents. This way, you can make sure that tickets and customer calls are being routed to the right people. Zoho Desk can also seamlessly blend with other native Zoho applications, making it easy to accelerate and streamline your workflow. Should you have other software that you’d like to merge with your Zoho Desk platform, this software has API functions that let it integrate with third-party telephony systems, collaboration tools, and other business systems. The vendor has an appealing free trial where you can tinker with the features at no cost. You can sign up for the Zoho Desk free trial here. Wix Answers is a cloud-hosted help desk platform for businesses of all sizes. It provides businesses with everything they need to improve customer service. It is equipped with ticket management options for multiple communication channels and has a built-in call center system that you may access on any browser. Aside from having robust ticketing tools and call management systems, Wix Answers has tools that let users set up self-service support options for their customers. Whether you want to create a knowledge base or an FAQ section for your site, this platform has all the features you need. You may even customize these according to your branding to make it look more professional. To make things even better, Wix Answers is free to use if you are already using their website builder. Just add the module to the website builder’s interface, set up your contact information and database, and you’re good to go. In case you aren’t using the Wix Website Builder, you may still get access to this module free of charge, however, you will be prompted to pay for certain features and add-ons. You can use all the features for free for a period of time to see if the software matches your needs. Simply sign up for a Wix Answers free trial here. Vision Helpdesk landed a place on our list for its unique features for multinational companies. Like the other products on this list, it offers robust multi-channel and multi-brand help desks that can be configured according to your operation’s needs. What sets it apart from its competitors is its Satellite Desk module. If you’re thinking of putting up a shared customer support for different companies or brands, this module is a must. The tool allows you to manage help desk or IT service desk of different sister companies using only one centralized portal. Companies with different brands can also use this platform. The Satellite Desk can white label the sections for each brand even if you’re using a single platform. The help desk solution also comes with standard enterprise help desk and ITIL service desk. These include: ticketing management; multi-channel communications; CMDB; asset management, knowledge management; change management; and release management. If you want to investigate the features closely you can easily do so when you sign up for a Vision Helpdesk free trial here. Often referred to as the ‘Freshdesk’ of IT service desk and service management, Freshservice offers a plug-and-play simplicity despite having robust features. It’s used by around 10,000 customers worldwide, including brands like Honda, Veeva, and Fitbit. One highlight that particularly impressed us–and is unique in the category–is its ability to create contextual articles in the knowledge base. Customers who search for solutions in the self-service portal also receive suggestions on related guide articles even as they type the query. This helps to unload repetitive issues off your tech team’s back so it can focus on more pressing problems. Freshservice, as expected with a top help desk software, also has robust ticketing module, asset discovery, and CMDB that gives you the big picture on configuration items, log changes, and relationships. Likewise, the software’s service catalog gets our attention, mimicking an e-commerce portal, which makes it simple to raise tickets and receive resolution updates. If you want to get a better grasp of the features that this software has to offer, you may sign up for a Freshservice free trial here. SysAid is a fully integrated IT help desk solution. Designed for large businesses that need to effectively manage service requests within their workplace, this software offers a plethora of technical support features. These include ticket management, patch management, case routing, and help desk automation. It also has a remote control tool that lets you get full control of your technical support operations from anywhere and at any time you wish. All you need to do is access the platform using your iOS or Android device, and you’re good to go. This feature is especially useful for managers and business owners who are always on the go. Lastly, if you are particular about making sure that all of your equipment are in tiptop condition, SysAid also doubles as an asset management tool. With it, you can perform hardware and software inventory management with just a few clicks of a button. You can try all its premium features at no cost when you sign up for a SysAid free trial here. LiveAgent features an all-in-one customer service framework, but it places great emphasis on live chat. Like Freshdesk, it is easy to use and has a suite of help desk tools. While its features are not as scalable as those offered by its competitors, this help desk solution makes up for it by offering the most competitive plans for small, medium, and even large companies. It is equipped with a chat widget that integrates smoothly with websites and apps to help you connect with customers in real time. This helps you reach out to customers or address valid concerns as they are reading about your product. Aside from the chat widget, this software also supports other channels through which you can get in touch with customers. These include emails, calls, as well as social networking sites like Facebook and Twitter. LiveAgent also features a unified storage where you can view queries from different sources in a single window. Moreover, even when you’re offline, you can direct queries to your knowledge base and encourage customers to be self-reliant for repetitive issues; thereby, reducing your team’s workload. You also get full support even for basic plans. You can check the solution closely when you sign up for a LiveAgent free trial here. TeamSupport stands out among our help desk solutions in the list because it deliberately targets B2B customers. If your customers are businesses, this help desk software is tailored to your needs. With this, you can give your customers more comprehensive replies that resolve issues faster. In fact, one of its features that caught our attention is that it lets you send detailed instructions via an integrated video tool. Conversely, this tool allows you to receive screen grabs of the customer’s technical issue. This tool suggests that TeamSupport is thinking of tech vendors for their help desk software. However, it is important to note that it is used by a diverse pool of clients that include Fujifilm, NBA, Comcast, and American Lung Association. With that said, you can rest assured that TeamSupport can address the needs of businesses from different industries. Some of its best features include: advanced reporting, self-service portals, live chat, and ticket management with automation. TeamSupport also features a collaborative tool to let your agents discuss about a ticket for a well-rounded response. Moreover, its mobile platform is compatible with Android, iOS, and Windows Phone. If you want to know more about the features you can easily sign up for a TeamSupport free trial here. Unique from its competitors, xSellco Helpdesk is a customer support system created for eCommerce businesses. 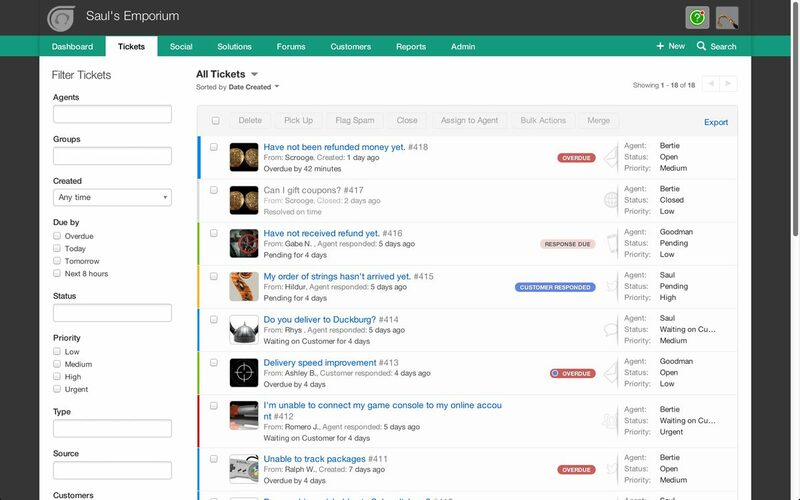 It offers comprehensive ticket management and call management tools as well as a centralized and customizable dashboard like other help desk systems. However, what really makes it useful for companies with online stores is that it integrates with online marketplaces, shopping carts, and other eCommerce web platforms. This way, you don’t have to exit your online store to manage your customer support efforts. In addition to its specialized set of help desk features and extensive integration options, xSellco helpdesk also offers a number of tools to reinforce your operations. It has a collision detection tool that ensures your agents are not working on the same tickets, shipping status tracking that help you manage orders that are on their way to customers, as well as collaboration tools that can improve the performance and productivity of your team. If you want to check its comprehensive feature set you can easily sign up for xSellco free trial here. ManageEngine ServiceDesk is a fully integrated, modifiable IT help desk system for all business sizes. Available for on-premise deployment and cloud-hosted deployment, this software has an intuitive and easy-to-navigate interface that can carry out ITSM workflows according to the requirements of your business. Moreover, it is completely mobile-responsive, so you can monitor your operations using your iPhone, iPad, or Android device. Another great thing about this platform is that it does not limit itself to help desk solutions. It also has asset management options and knowledge base creation tools so you don’t have to rely on multiple programs for your operations. In addition, the software has API functionalities, allowing it to support out-of-the-box integrations with third-party applications. The vendor offers a comprehensive free trial to get you up to speed with the features. You can sign up for the ManageEngine ServiceDesk free trial here. HelpCrunch is an innovative customer communication platform with complete functionalities for help desk management and customer engagement. From ticketing and email automation to workload distribution and feedback collection, this software will help you streamline your entire customer service process. It even unified your communication channels in one window so you can reply to chats, schedule emails, and even monitor engagement campaigns without leaving the platform. One more thing that makes HelpCrunch a great software is that it provides users with reporting and analytics features. With this, it is easier for businesses to check the impact of each customer interaction, improve customer targeting, and gauge customer satisfaction levels. By doing so, you can find out what makes your customers tick and determine surefire ways to boost repeat purchases. You can easily sign up for a HelpCrunch free trial here and get to know the features firsthand at no cost and without commitment. JitBit Helpdesk is a web-based help desk system ideal for businesses who want comprehensive customer support tools without the complexities of a traditional ticketing program. It combines all the essential functionalities such as ticket routing, ticket filtering, canned replies, auto-responders, and asset tracking in a simple and easy-to-navigate UI. Moreover, the software has native iOS, Android, and Windows Phone apps that can improve your operations’ mobility. While JitBit Helpdesk is known for its straightforward interface, it also does not fall short when it comes to configurability. It can integrate with hundreds of third-party applications, so you can extend its capabilities according to the changing needs of your operations. Whether you are looking to add data management tools, customer engagement applications, or other add-ons, you can be sure that this software solution will be able to support it. The vendor has an appealing free trial where you can tinker with the features at no cost. You can sign up for the JitBit Helpdesk free trial here. Hiver is a corporate software solution that combines the power of email management and SaaS helpdesk in one convenient interface. With this, businesses can perform various sales and customer support tasks using only their Gmail account. Because of this, you can eliminate long learning curves associated with full-fledged help desk systems as well as avoid hefty fees that one would normally pay for traditional SaaS ticketing tools. It makes use of shared inboxes, notes, labels, and reminders that allow customer support staff to streamline communication efforts. This way, responding to customers is faster than ever. Aside from its robust collaborative tools, Hiver has features that let users create contact groups for their different target demographics. There are also options to create and share email templates as well as schedule bulk emails ahead of time. You can use all the features for free for a period of time to see if the software matches your needs. Simply sign up for a Hiver free trial here.